About a week ago I had a recipe that called for chicken stock, often I find that chicken stock is called for in the oddest of places. Like in a vegetable soup, I mean really? Why take something intrinsically vegetarian and add meat? This happens all the time and the reason behind that I hear most chefs say is: it enhances the depth of flavor. Sure, but so do spices, herbs and salt. Also how much of the chicken stock you buy in a can or box or cube is just salt and herbs and spices? My rule of thumb is if the recipe is just vegetables I don’t use chicken stock, vegetable stock or water work just as well and then you can salt to your liking. The reason I made chicken stock was for a chicken curry recipe and it seemed appropriate for this saucy dish that was all about chicken to enhance it with chicken stock (though if you didn’t have it or didn’t want to make it water or vegetable stock would have worked fine, especially given how much dry spice is added to curries). Turns our having a huge vat of chicken stick in the fridge can be a very good thing. Last week the cold weather started to make my bones ache and Neil and I were quickly becoming house bound not wanting to go out unless we absolutely had to. So one night Iw as scratching my head trying to figure out what to make for dinner that would take warm us up and not require a grocery store run. Rummaging through my crisper I had left over green beans, carrots, celery, fingerling potatoes, Thyme and of course lots of onions. I also had in the freezer some chicken thighs, so we were set. I fried up the onions in a generous splash of olive oil, after they had wilted added a little minced garlic, 3 carrots peek and sliced into thick rounds, the entire center section of celery (about 4 stalks and lots of leaves) and handful of fresh Thyme – about 6 or 7 branches. I don’t de-leaf my Thyme just thrown it all in and when the soup is done the leave have come off in the cook and all you need to do is fish out the branches. Taste again and season further if need be. Serve with some left over bread you’ve toasted with fresh garlic and olive oil. You don’t even need a salad as the soup is so chock full of veg. Another take on this would be to replace the onions with scallions and the thyme with ginger and flavoring with a splash of soy sauce. The point of this kind of dish is to make use of what is left over in the fridge, any combo of vegetables is good. If you don’t have Thyme then Sage, Rosemary or even Tarragon would all work. 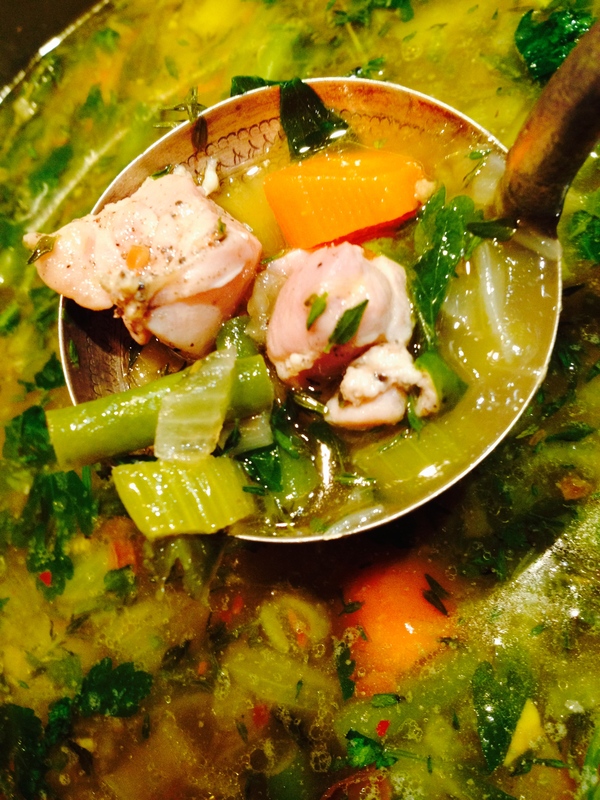 Hearty chicken soup is the perfect warmer upper food for this long cold winter! 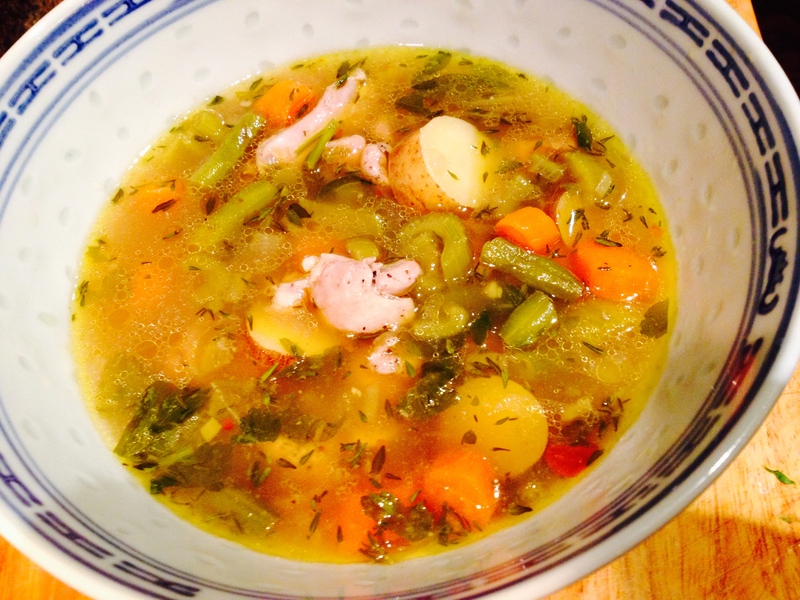 This entry was posted in Recipes and tagged hearty chicken soup. Bookmark the permalink.